(Newser) – Well, this is ... interesting: You can now pay half the average South African's monthly salary—or $82 a night—to stay in a slum. Not a real one, as some one billion people worldwide do; instead, Gizmodo reports, South Africa's Emoya Luxury Hotel and Spa is offering the experience of "a Shanty within the safe environment of a private game reserve." 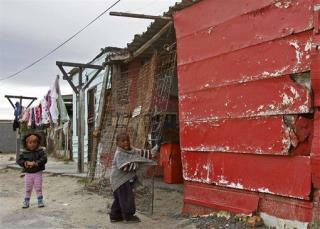 The fake slum, near Bloemfontein, is offered as tours of actual slums gain popularity. Utterly absurd. Wonder what the workers at this place think; most of them probably have to live like this, but without the heating and wi-fi. "the most tasteless and offensive tourism idea ever." And just plain stupid too! Why would anybody want to do that?